I have featured this dish eons ago, but it’s worth revisiting for newer readers or old-timers looking for new old dishes to cook when avoiding meat. First, clean your crabs, see this popular post, and set them aside. In a large pot or pan, saute lots of minced ginger, garlic and onion in vegetable oil. Add the crab pieces and stir for a few minutes, until the crab is just slightly cooked. Add several cups of chicken broth and cover and let the crab steam a bit until nearly cooked. Take the lid off, add the pre-soaked sotanghon noodles, several tablespoons of kikkoman soy sauce and several tablespoons of oyster sauce along with a tablespoon or so of white or brown sugar. Now I’m craving for sotanghon. Yum! Our alimango here on the Atlantic coast are so fresh…they’re alive. I always feel such a twinge when they look at me and bat their movie- star long eyelashes. Do I cook them or keep them as pets? But then my husband slaughters them out of sight with his trusty hatchet in the back courtyard, and I don’t think of their cuteness anymore when we cook and eat them! how nice! i also eat pansit with rice. We cook this with sabaw. But if its sitting for a long time and not eaten right away, hihihi, katulad ng picture above ang labas. Sarap nito, lutuin ko ito bukas, I usually add 1/2 lb of shrimp also. Sarap naman… I eat rice with pancit too…or pan de sal with butter. Haay, this is a very testing dish especially with Good Friday up. Fasting….fasting….fasting…. and abstain from eating too much! cool! thanks for that link to your how to clean a crab. i didn’t know you’d done one or i just completely forgot. I’ve been experimenting with crabs recently and I’ve found that deep frying the claws causes the meat to stick to the shell, while steaming it makes it much easier to remove the meat as a whole. Steaming also seemed to make taking the meat off the body much easier, as it didn’t stick too much to the cartilage. I was thinking of pritong isda and tomatoes for tomorrow. This is a much better alternative. Nakakagutom talaga. MM were these male or female. The coral of the male is not as firm as the female. Did this make the sotanghon kinda soupier? Thanks. Bring out the crab-crackers and crab-picks for this great meal! Yes! Sotanghon eaten with rice! Alas I’m vindicated! Drove my mom nuts too whenever she makes her own iteration of and I ask for rice—she gets defensive and says she hardly put any salt–but it’s not that, i can never explain why. This is definitely begging for rice–the colors alone make me drool. I can almost smell it. Pass the calamansi please. time to come to TO! Millet…go back to Alimasag gata post…had another lightbulb moment (respone to Stewart’s comment) for you if you haven’t tried it yet or if there is nothing close to it there yet. My mother in law cooks this same dish except with chicken. I imagine the crab kicking it up 3 notches! 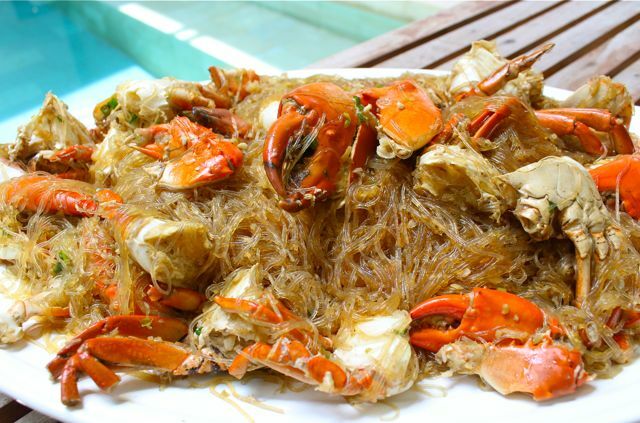 I eat this in Thailand where it’s called Poo Ob Woon Sen or Baked Crab with Vermicelli/Cellophane/Glass Noodles (woon sen = sotanghon). It’s traditionally prepared in a clay pot and not normally baked. I’ve noticed that anything cooked in a clay pot in SE Asia gets transliterated as -baked- in English. The Thai recipe is VERY similar, except that coriander (cilantro) root is added along with the ginger & garlic. 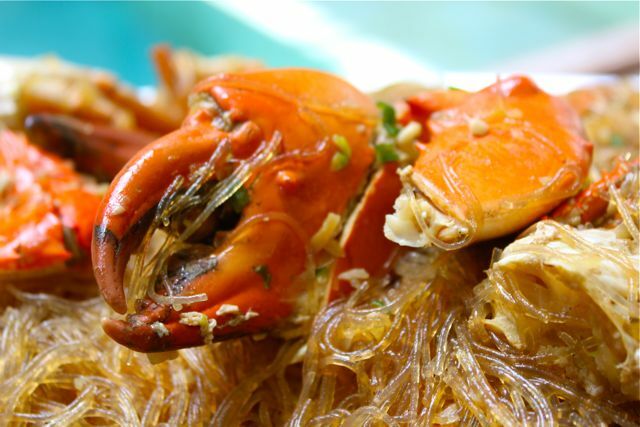 this is one dish i never cook or order because i don’t like the noodles fighting for space with the crab! This is one of my favorite marketman recipies. 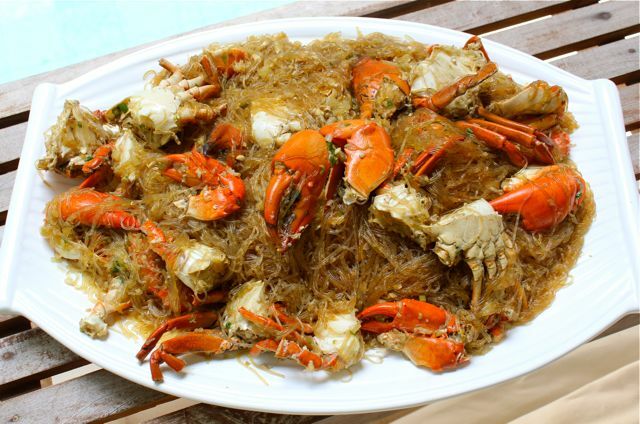 i also cooked your crab sotanghon for holyweek. however i changed the vermichelli to the korean vermichelli for a thicker noodle. i feel it tastes better. Protected: Congratulations to the Class of 2013!! !